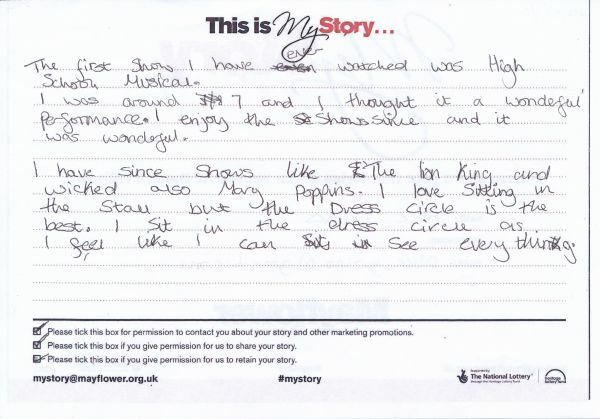 My Story card: Alice Barnes remembers seeing shows from the dress circle. The first show I have ever watched was High School Musical. I was around 7 and I thought it a wonderful performance. I enjoy the shows since and it was wonderful. I have since [seen] shows like The Lion King and Wicked also Mary Poppins. I love sitting in the stall[s] but the dress circle is the best. I sit in the dress circle as I feel like I can see everything.